YEP. I think it’s safe to say we are deep into winter. Because of this “once in a generation” level of cold, I have been craving something super cozy. Since meat has been tough on my stomach to prepare, I’ve been looking for protein packed vegetarian meals. I was deep in Instagram stories, and saw the folks at Basically (by Bon Appetit) making this dish–it fit the bill perfectly. I used a crusty sourdough loaf and Ezekiel bread- but the original recipe calls for a crusty country bread (mmm yummy! ), but to make it Month 1 #shedapproved just use Ezekiel. I honestly barely noticed the difference between the Ezekiel and sourdough once it was all together! I would skip going back for seconds if you are shedding, but doubtful you would even want to! It is incredibly filling! Other changes I made: I skipped the beginning steps and just used Trader Joe’s amazing Mirepoix. Easy > Everything. Also, I had thought I had a chunk of parm at home, but it turned out to be Romano, so I ended up a bit of pre-grated parm and Romano early on instead of the parmesan rind, however, if I hadn’t of needed to I wouldn’t have skipped that step. I’m sure the rind really adds depth! Place a rack in middle of oven; preheat to 450°. Time to prep your veg! You are going to make a mirepoix, which is just a fancy French word for the combo of chopped onions, carrots, and celery that form the flavor base for a lot of European dishes. First, cut 1 large onion in half through root. Peel and discard skins. Finely chop and transfer to a medium bowl. If using TJ’s Mirepoix skip to step 4. Wash, peel, and trim 3 medium carrots. Cut in half (or in quarters lengthwise if they’re large), then cut crosswise into ½" pieces. (You can also just chop the carrots down into coins if you don't mind larger pieces of veg in your soup.) Add to bowl with onion. Chop 2 celery stalks crosswise into ½" pieces. Add to bowl with the rest of the mirepoix. Smash and peel 8 garlic cloves with the back of your knife. If any of them are left more or less intact after that initial smashing, give them another good wack with the back of your knife so they really open up and start to break apart. Add to bowl, also. Strip stems from 2 bunches Tuscan kale and discard. Wash if they're gritty or you really care about washing vegetables, then tear leaves into 2" pieces; set aside. Cut rind off of 1 small Parmesan wedge; set aside. Place 28 oz. canned tomatoes and their juices in a strainer set inside a medium bowl. (You need that bowl to collect the juice, which you're going to use later—don't throw it out!) Squeeze tomatoes and crush them with your hands while leaving them submerged in their liquid so they don’t squirt. Tear ½ loaf crusty country bread into 1½" pieces. Heat ⅓ cup extra-virgin oil in a medium Dutch oven or heavy pot over medium. Add bowl of mirepoix and 2 tsp. salt and cook, stirring occasionally, until vegetables are softened but not browned, 8–10 minutes. While tomatoes are cooking, drain and rinse 14 oz. canned cannellini beans in the strainer you just used, then add to pot along with Parmesan rind, tomato juices, ¾ tsp. red pepper flakes, and 4 cups water. Bring to a simmer. Add kale in two additions, stirring often and allowing to wilt in between. Add about one-third of torn bread (no need to measure, just eyeball it) and cook, stirring occasionally, until coated and warmed through, about 5 minutes more. Taste and adjust seasoning. Remove from heat. Place remaining torn bread chunks on top of stew. Drizzle generously with olive oil. Transfer pot to oven and bake stew until thick, bubbling, and bread is golden brown on top, 10–15 minutes. Ladle stew into bowls, drizzle each generously with olive oil, and grate lots of Parmesan over. Pollo Italiano - Shed Program Preview Recipe! It’s Friday night. Cue the mood lighting, pour a couple glasses of red, Alt-J is jamming through your stereo. Candles are lit. It’s cozy AF right now. Time for a little date night at home with your boo and this meal from the Shed Program, Pollo Italiano! I love this recipe because 1) tomatoes, 2) basil, and 3) garlic. I mean there isn’t a better combo than that! The chicken breast is never dry in this recipe AND it also has a subtle sweetness that brings it all together! I think its pretty much perfect in all seasons too! Obvi, cherry tomatoes are best in the summer buttttt let’s be honest, I buy them all year round. This recipe is one of the many recipes from the Shed Nutrition Program! And today is the last day to get the launch discount of 20% off the Silver plan! Use code: TWOSHEA20. It expires at 11:59 CST tonight! In a large skillet (preferably, nonstick), heat 1 tbsp olive oil over medium-high heat. Pat the chicken breasts dry with paper towels and season them generously on both sides with salt and cayenne. Add the chicken to the pan and cook, lowering the heat to medium if your pan starts to smoke, until nicely browned on both sides and just pink in the middle, about 5 minutes per side. Move chicken to a plate and tent with foil. Add the remaining olive oil to the pan, along with the garlic and tomatoes. Cook until the tomatoes begin to burst, stirring occasionally and scraping up any bits of chicken from the bottom, about 5 minutes. Add the broth and balsamic and using the back of your spoon, gently crush the tomatoes so they release all their juices. Simmer the sauce for another 3 minutes until it’s thickened and the acidity has mellowed. Stir in the ½ tbsp basil and taste for seasoning, adding more salt as necessary. Add the chicken back to the pan and simmer until it’s cooked through. Remove from the heat, garnish with remaining basil. Place quinoa and water in a small pan over high heat. Once it boils, turn heat down and simmer until water is absorbed, approximately 10 minutes. Set aside. Add broccoli and quinoa to wok, stir. Add liquid aminos and almond butter, mixing thoroughly so everything is coated. You can add a little bit more liquid aminos, if necessary. Pepper to taste. Serve warm. *Alternatively, you can steam the broccoli in the pan, but takes longer. Add broccoli to the pan with the other vegetables, and place a lid on top. Check frequently until broccoli is bright green. The texture may be a bit different, but equally yummy. GF "Breaded" Chicken Thighs AKA "The Best Chicken I Ever Made"
I was messing around in the kitchen last week, and was craving a breaded-style chicken. I had unopened almond meal in my cupboard, and voila, I came up with "The best chicken I ever made" - according to my husband. I served it on a cauliflower rice stir fry. Which was a random throw together of cauliflower rice, frozen broccoli and bell peppers, powdered ginger, paprika, liquid aminos and a dash of rice vinegar. The combo was amazing! "Breading" the chicken took an extra 5 minutes of prep compared to my usual go-tos, and it was worth it! The set up is easy enough! One bowl for egg and one for almond meal. Gluten Free "Breaded" Chicken Thighs aka "The Best Chicken I Ever Made"
Preheat oven to 375 degrees Fahrenheit. Grease baking dish with olive oil spray. Dip chicken thighs on each side in egg. Batter with almond meal. Add to baking dish. Gratuitously add herbs de Provence, salt and pepper. (Note: You could mix the herbs de Provence in the almond meal mixture, but it turned out great just sprinkling it on top.) Some almond meal will come off where you grab the chicken. I just sprinkled those spots with more almond meal once they were in the baking dish. Serve warm, but it's great cold for lunch the next day too! There was a restaurant near my old job called Moxee. It recently closed (shame, it was really good! ), and they had a dish called the "Three Sisters." To be 100% honest with you, I never had ordered it because 1) beans cause indigestion for me - and I didn't want to eat them at work and 2) typically work was paying, and I went for a higher priced item, like a blackened salmon salad. That being said, this was a favorite for a lot of my colleagues (apparently they didn't have the same issue with beans... *side eye*). I was asked recently to try and recreate it. The humor in all of this is that I had never eaten it. So I basically I took the ingredients and made my own #shedapproved version. But first, I was intrigued, I hadn't heard of the "three sisters" before this, so I did a quick google, and I was fascinated by my findings. According to the all-knowing Wikipedia, apparently, the three sisters are the three main agricultural crops of various Native American groups in North America: winter squash, maize (corn), and climbing beans. "The three crops are planted close together and benefit from each other. The maize provides a structure for the beans to climb, eliminating the need for poles. The beans provide the nitrogen to the soil that the other plants use, and the squash spreads along the ground, blocking the sunlight, helping prevent the establishment of weeds. The squash leaves also act as a 'living mulch', creating a microclimate to retain moisture in the soil, and the prickly hairs of the vine deter pests. Corn, beans, and squash contain complex carbohydrates, essential fatty acids, and all eight essential amino acids, allowing most Native American tribes to thrive on a plant-based diet." I mean, I don't know about you, but I think that this is pretty much the most amazing thing ever. How cool that the Native Americans figured this out: 1) From an agricultural standpoint and 2) from a biological, nutritional perspective. This inspired me to do the dish justice. I got to work. Here was the menu description: "Vegetarian hash with roasted butternut squash, corn, and pinto beans (3 sisters) topped with sweet peppers, onions and a light roasted garlic sauce with a grilled herb polenta cake." Well, no knock to polenta, but it's not shed approved, so it was out. To give homage to our South American Native Americans (hello Incans! ), I thought quinoa could be a good substitute. As I had never made a "quinoa cake" before, I looked to pinterest for inspiration. It did not disappoint. I found a recipe from the Domestic Superhero that seemed would work perfectly. There was a catch, she had used breadcrumbs in her recipe (not Shed approved) – would it still work? Well spoiler alert: it worked just fine without them. Didn't miss them either! Also, I made one other big change to the original menu item - the light roasted garlic sauce became tzatziki. This gives it a bit of a mediterranean flair (I'm Lebanese, what can I say, can't help myself!). The lemon zest and feta were just asking for the tzatziki. While these vibes seem to not be the same, I can tell you, the flavors complimented each other beautifully. The rest of the recipe seems to speak for itself. I hope you try it- it's perfect for #meatlessmonday! Have a great day, beauties! Heat 1 tbsp olive oil over medium heat. Add butternut squash, cook for a couple minutes. Add garlic and add liquid aminos. When butternut squash is 75% finished (softer, but not cooked all the way through), add pinto beans and corn. Mix well. Cook until butternut squash is soft. While butternut squash is cooking, in another skillet heat 1 tbsp olive oil over low heat. Add 1 cup chopped onion and sweet peppers. Cook until onions are browned and peppers are soft. Serve onion and pepper mix on butternut squash mixture. Pair with Feta Spinach Quinoa Cakes. Add the eggs, quinoa, feta, lemon zest, and 1/4 tsp black pepper and mix well. Let the mixture sit for a few minutes to allow the bread crumbs to absorb some of the moisture. Wipe out large skillet, and add extra virgin olive oil. Heat for a few minutes. Serve with a dab of Tzatziki sauce on each patty. I eliminated breadcrumbs, a homemade sauce, and dill from the original recipe. Breadcrumbs were eliminated because they are empty calories. The recipe works without them, but I’m sure it would be great with them as well. To make life easier I thought it best to use pre-made Tzatziki which already has dill in it. Thought doubling up on dill was unnecessary. Lastly, you could try baking the patties as well to time the meal better. 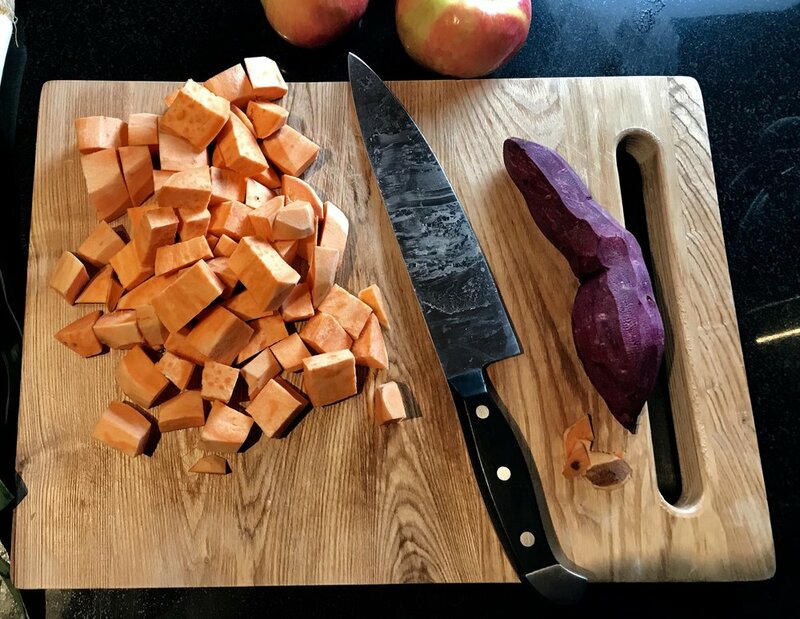 Update 2/13/18: The first version of this post was missing the measurement for butternut squash. Error is now corrected. Hey y'all! How have you been doing on your daily gratitudes? I would love to here all that you are thankful for! Remember to tag me and use the #shedgratitudechallenge if you decide to post! ...And did I mention it's flexible? Top this dish off with a fried egg and make it a breakfast! Or switch up the texture with some nutrient dense kale! Play around and have fun with it, it lends itself so easily for fun swaps! In a skillet, sauté oil and garlic over medium heat for 1 minute. Add in chopped sweet potato and stir. After 4-5 minutes, add in peppers and onions. Sauté for about 5 minutes, stirring occasionally. Mix in ground turkey, rosemary and thyme. Break up turkey with your spatula or spoon. Let cook for 5-7 minutes, stirring often. Mix in fresh spinach, and cook for 2-3 minutes, or until slightly wilted. Remove skillet from heat and serve hot. A couple weeks ago I was completely overwhelmed with things to do. I had so much work to do, I was cleaning like a fiend for house guests, I had too many social things on the docket in a very short amount of time, and my husband was out of town for work. It was time to whip up the old trusty crock pot. 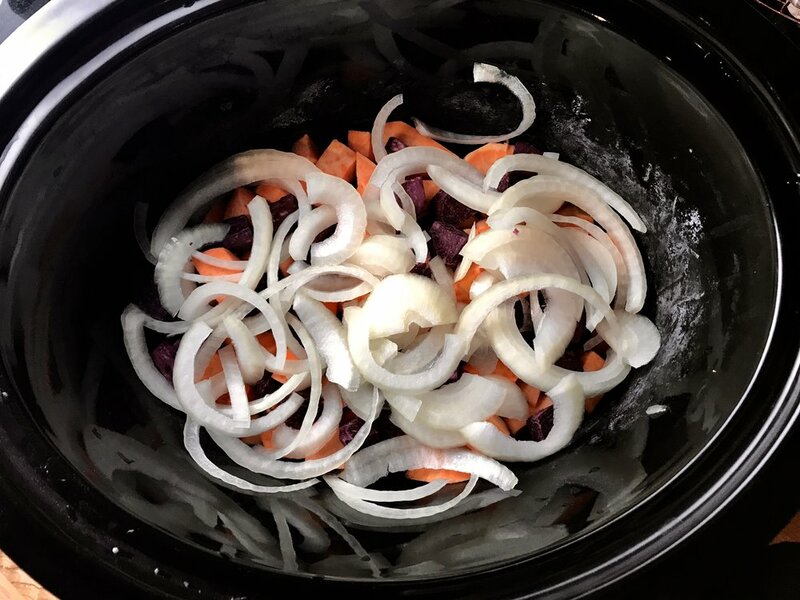 I love slow cookers because once you set them, you forget them, and your house smells amazing for hours. It is pretty awesome. I am also absolutely awful at making up recipes for slow cookers. I truly just don't get how to get the right flavors to mix properly when they are cooking slowly for hours. It is a very clear gap in my culinary experience. It's on my to do list. I had purple sweet potatoes, and I swapped one out for one of the normal sweet potatoes. Another confession is I am actually notoriously bad at following recipes. I chopped the apples a bit too small, which made it look a bit mushier than I would've liked. I think this recipe is a knockout. Especially if you want something gluten and dairy-free! I will definitely be making this again soon! 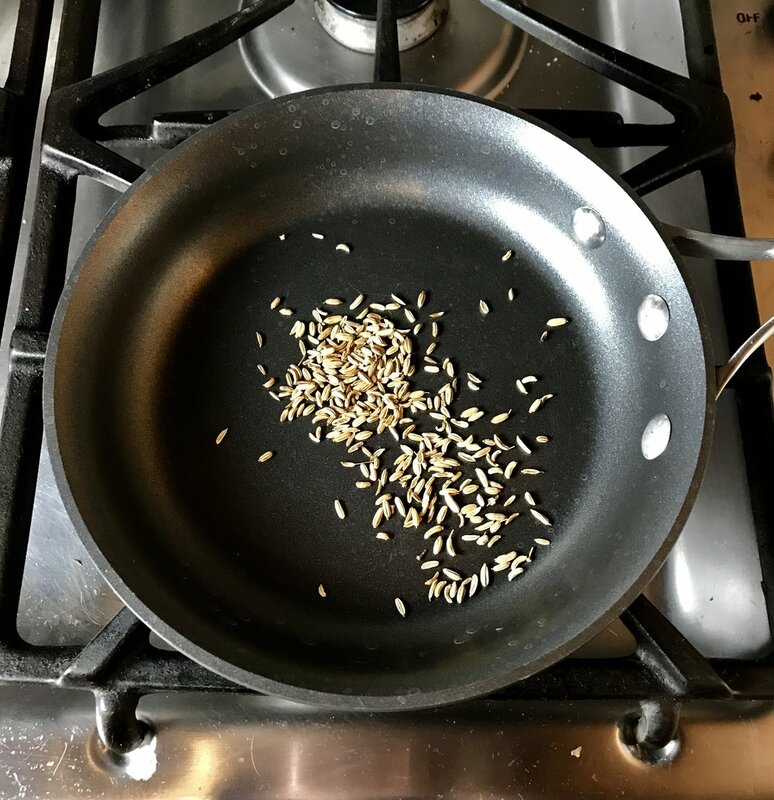 Toast fennel seeds in a small skillet over medium heat until fragrant, about 2 minutes. Cut chicken thighs in half. 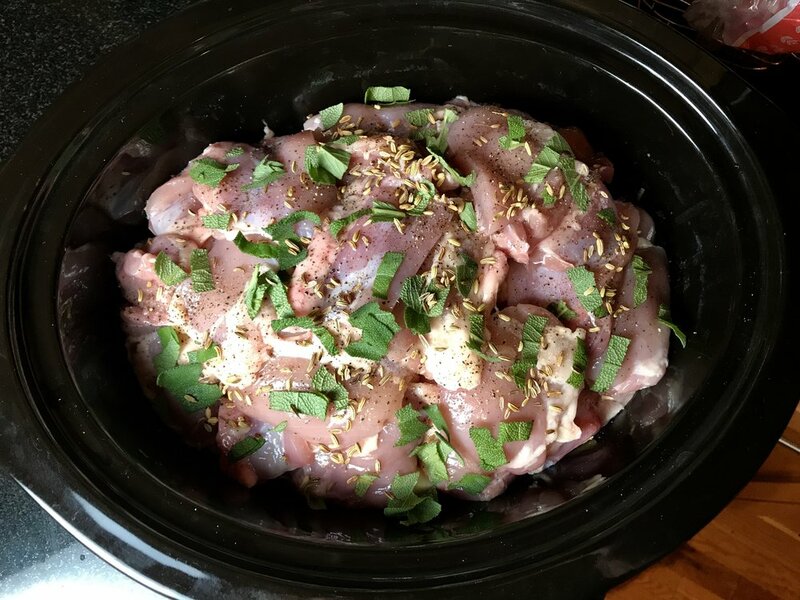 Add chicken, fennel seeds and all remaining ingredients to a slow cooker. Cover and cook on low until chicken and apples are very tender, 6 to 7 hours on low or 3 to 3 1/2 hours on high. Per Serving: 300 calories (70 from fat), 8g total fat, 2g saturated fat, 165mg cholesterol, 610mgsodium, 19g carbohydrates, (4 g dietary fiber, 11g sugar), 39g protein. I really don't have much to say about this, except for that rarely I give myself a 10/10 on a recipe, and this meal 100% gets a gold star. Please make it. You deserve this dinner. It's so freaking delicious. You may think you don't need to eat the full serving, but I'm telling you in advance, you will eat all of it. Cut spaghetti squash in half lengthwise. Deseed with a spoon. Coat basin and sides with 1 tbsp olive oil. Place on a shallow baking tray greased with olive oil. Salt and pepper. Place in oven. Cook for 50 minutes. Heat 1 tbsp olive oil over medium heat. Add garlic to pan. Stir occasionally until garlic has a bit of color. If it is browning too quickly turn heat down. Add ground turkey to the pan. Use your spatula to break it up into smaller bits. Keep cooking on low, stirring occasionally, so it is nice and brown. Remove spaghetti squash from oven (at 50 mins) and let sit. (I was impatient and waited 5 minutes and used a mitt to hold it.) Take a fork - scratch to create “noodles”. Add noodles to ground turkey mixture. Add 1/2 jar of TJ’s organic marinara. Add in almost all the Romano in (saving a bit for garnish) stir to coat. Serve back in the squash (I prefer this way because you maximize the amount of squash you can eat!) or in a bowl. Top with remaining Romano as garnish.